Because it was far too cold to take pictures outside last week, I decided to shoot some outfits indoors to share with you. If you aren’t already taking pictures of your outfits, I highly recommend making it a habit – not only will you learn what silhouettes best flatter your shape, but it’s a great way to remember outfit combination ideas for future reference. 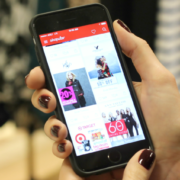 I have all of mine stored on my phone & categorized by season into different albums – particularly helpful for those mornings when you wake up & feel like you have nothing to wear! 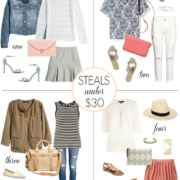 I hope that these looks will provide you with more layering ideas for the season – I’m also highlighting a few of my favorite pieces that are currently available and many on sale now! 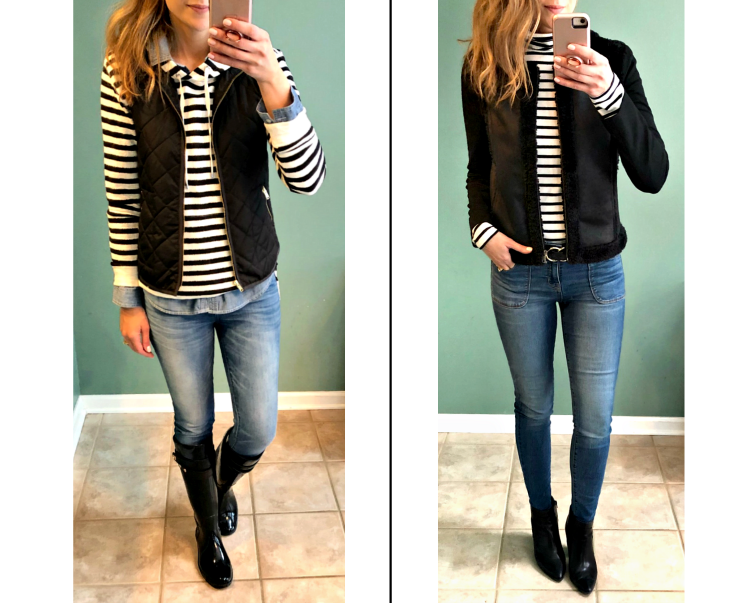 I’ll never get tired of stripes and here’s two ways to wear them for the season – one more casual look and one that’s slightly more polished. This sweatshirt is a recent purchase of mine that I love and can wear now with laid-back layers & later in the spring on its own (it also comes in a neutral stripe). This striped turtleneck is a layering essential for me – I wear it under sweaters, jackets, blazers and vests – love that it doesn’t add unwanted bulk. You’ve seen me wear this leather belt a lot over the last few months & it is my absolute favorite (also comes in two other colors). Life hack: I use this leather punch tool to make all my belts fit both low & high on my waist – it’s a lifesaver! 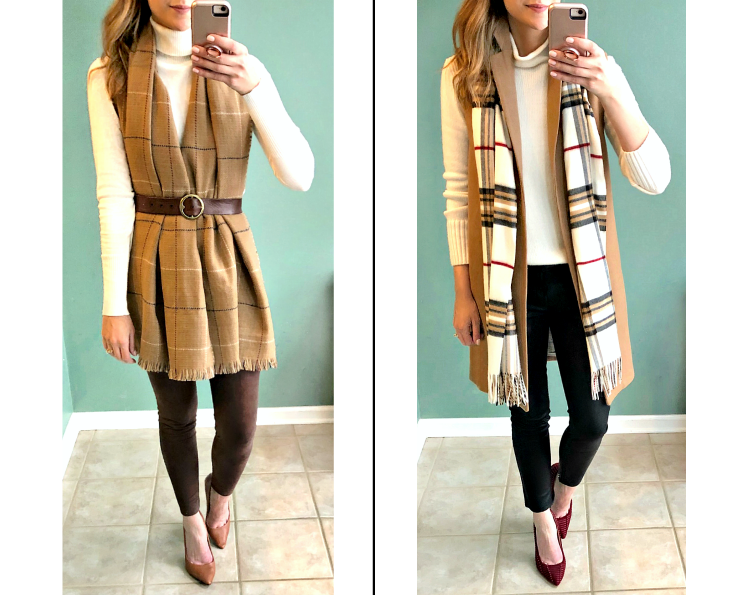 Here I’m sharing different ways to style scarves – the first look is with a blanket scarf and, instead of wrapping it around my neck, I simply draped it over my shoulders and belted at the waist to create a flattering silhouette. These faux leggings are a gorgeous chocolate brown color that’s perfect for pairing with other neutrals – they are so comfortable & currently on sale! The second look is a plaid oblong scarf with fringe and I used it as more of an accent here to add interest & pull all the colors together. This camel vest is one of my most-loved wardrobe pieces – it’s over 3 years old, but I found a very similar option for you here. When you wear a long vest in cold weather, what type of coat do you wear over it. I have a long sweater vest I never wear because of this. It never seems to be perfect weather to wear it without another layer outside. I have a black wool coat that is a longer length and I purposely bought it a little big so I could wear layers like this underneath – it works perfectly! I can see where a long coat could work. People don’t wear many long wool coats where I live in Louisiana, so I guess that is why I didn’t really think about that option. When it gets cold here most people wear thigh length coats. That camel vest is very nice! I love both of these outfits. Stripes and flannel will always be 2 of my favorite patterns. I love what you did with the plaid! So cute!! Such cute outfit combos — totally loving the stripes!